Every company wants to grow. While it’s easy enough to say, doing it is a whole other ball game. The preparation part that can be tricky, especially when this growth comes all at once, also known as hypergrowth. Managing a growing business is hard enough, but managing a business that is expanding at a rapid pace can sometimes seem impossible. Hypergrowth can be difficult no matter how prepared you may be; which makes being able to realize and admit when you are doing something wrong essential to successfully managing hypergrowth. So how do you prepare yourself? We’ve experienced a lot of growth at New Breed over the past couple years, and have some advice on Sales 101 to offer with regards to structuring and preparing your team for hypergrowth. We mean this figuratively of course, but in all seriousness, we cannot express enough how important it is to make sure you have everything in place before hypergrowth can happen. Consider the tools you’ll use to succeed. At New Breed we are big fans of software platforms like Workamajig, HubSpot and Salesforce because they work to scale workload management and increase business visibility. With these automated aids, it’s easier to allocate time and resources where needed, and make adjustments before issues arise. Another way to prep is to make sure employees are properly trained. Don’t wait until it’s too late to properly prepare your team for expected growth. Ensuring that everyone is on the same page when it comes to company policies, goals, tools and software programs can be the make or break difference when you are in the midst of hypergrowth. Let me start by saying, a CRM system is NOT a sales process, it’s a tool. Great technology can play a huge role in transforming the productivity of any process, but understanding the process of attracting interest, converting, and ultimately, closing the sale, is what really drives growth. At New Breed we not only follow the inbound marketing methodology, but we also utilize inbound sales. The two go hand and hand, which means that establishing a solid inbound sales process before your company slips into hypergrowth is essential. 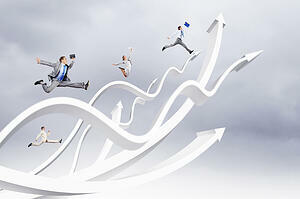 During interest growth, you will be experiencing a leap in lead generation. If your sales team is not prepared with the tools or training necessary to close leads, you will miss out on revenue growth. We recommend mapping the buyer’s journey and targeting content and sale’s emails that align with their interests and funnel position. Following up with leads quickly is essential in today’s world. Everything else is happening so fast, people expect an instant response; sometimes even having to wait a day can feel like too long to a lead. So how do you keep up? We leverage technology to help us, and have found Signals combined with Salesforce to be very effective in staying on top of leads, identifying what they need and getting a better understanding of their interests. We also structure our sales funnel by persona, which helps us identify different offers and use nurturing techniques for top, middle and bottom of the funnel stages. Providing your sales team with templates when appropriate can also assist in the speed of response. Proposal prototypes can cut down the time that is needed to draft proposals and email templates can make responding to a lead much faster. You can also arm your sales team with the relevant content (case studies, success stories referrals, etc.) that appeal to your buyers. There’s no need to reinvent the wheel for each and every sale. Even if it doesn’t seem necessary, we encourage you to create now while you have time to spare - you’ll be glad you did when you are in the midst of hypergrowth. Establish a structure and system beforehand. Don’t forget to organize responsibility throughout each department: Who reports to whom? What exactly are the responsibilities for each department and individual? Answering these questions can help you maintain structure and ensure that no one gets left behind. Additionally, it’s important to detail processes and make specific measures to evaluate success. We aren’t just talking about revenue either. It’s important to measure other factors like employee and customer satisfaction, learning, innovation and growth. With this in place, it’s much easier to bring on new hires and get them up to speed. It can also provide better measures for determining which positions need to be filled and when, so you aren’t waiting until the last minute to take on new team members. Sound like a lot of work? Of course it is! But, anything you can do to prepare yourself now will make a lot less work in the future - and doesn’t that sound nice? Has your company experienced hypergrowth? What steps did you take to prepare for hypergrowth? We’d love to hear more in the comments!